When I was at school, one of our lessons – Food and Nutrition – involved writing a time-plan each week. We had to start at the end (serve dinner) and work backwards, working out timings. It wasn’t a favourite activity, but I still do it today whenever I’m planning an event or big meal. To be honest, I really hate cooking dinners, but don’t tell anyone that, because it seems to be one of the main things I have to do. Roast Gammon followed by Ginger Sponge and custard. I try to arrive at the supermarket early, so there are plenty of easy parking spaces that will allow access to the boot of the car, because my bags will be heavy. I am fairly rubbish at parking, even in an empty car park, so this is bit of a stressful event. I enter the supermarket at 8:45. Realise I have left all my shopping bags in the boot, so go back for them. Reenter supermarket at 8:50. Buy everything on list (see end of blog). Pay, and remember to put receipt safely in purse (this is another very difficult thing – which causes Husband some stress when yet again, I have lost it). When home, transfer things to fridge and freezer, and try to remember where they are so I don’t leave them there on Friday (it happens). I use my super-efficient Kenwood Chef mixer, which is the one piece of kitchen equipment I could not manage without. I make the sponges in two lots, each batch making 4 loaf-tin cakes (which are then easy to transport in a container). Being very old, I work in pounds and ounces. Put 1lb butter and 1lb caster sugar into bowl and mix on high speed. Add 8 eggs, one at a time, cracking into a cup first to ensure no shell/bad eggs. Beat very hard. Add 1lb self-raising flour and 28g ginger, mix, stir, mix. Put into 4 lined loaf tins, bake on 170º for about 35 minutes. While cooking, make the next lot. I set an alarm on the phone, but got it wrong, so they almost burnt. This happens more often than you might think. Put on cooling racks until cold, then pack into air-tight containers. Cut off the end of one sponge and ate it (to test it wasn’t too burnt. Plus they smelt really nice, and I was hungry). Put into car so I don’t forget to take them tomorrow (this also happens fairly often). Thursday afternoon: H phones to let me know that the boiler at church has broken, so there won’t be any hot water. Super. The plumber/engineer is coming to mend the boiler in a couple of weeks. Double super. Friday: Visit washroom 23 times and pray a lot – which is normal for someone who gets anxious about leaving the house. Mainly pray that I won’t poison anyone. Leave home 8:30am. 9:00 arrive, unload, put freezer stuff in freezer. Say hello to D and R, the ‘advance team’ who arrive. 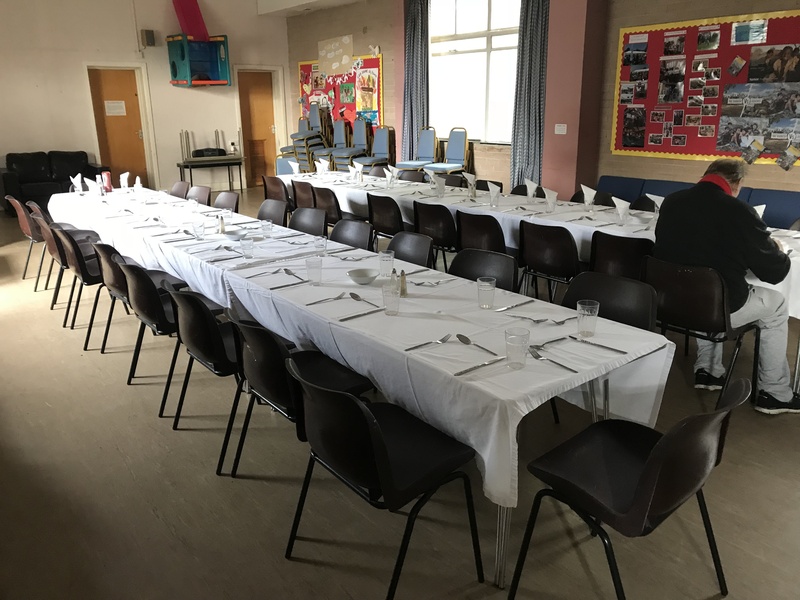 They are busy, returning the tablecloths from last week, which have been washed and ironed, setting up the tables and chairs. They also chat about growing up in the 1950s and make me laugh. 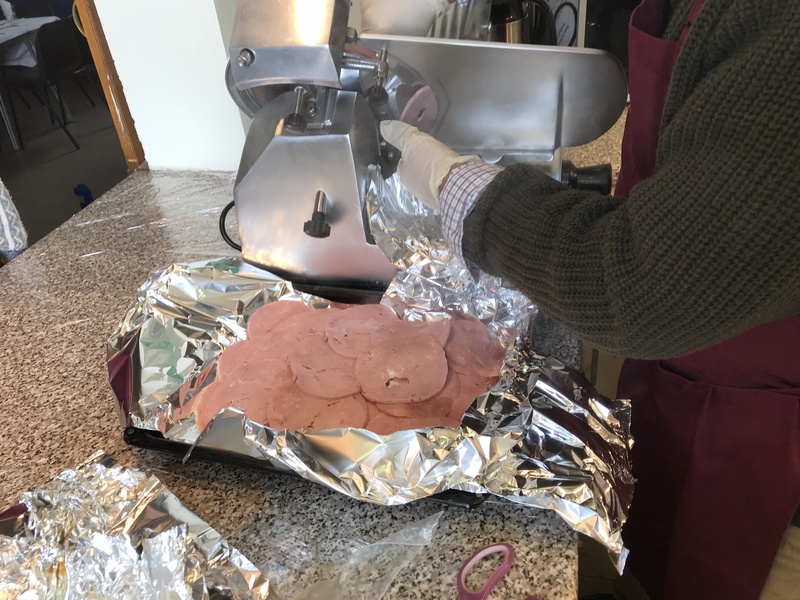 D has brought his meat-slicer, which means I won’t have to hack the gammons into pieces when they’re cooked. He isn’t meant to, in fact, I’m not sure he’s meant to be there at all as he has a major heart operation next week; but I am hugely grateful. We have a checklist for when we arrive, so I start to go through it: I wipe surfaces and bleach sinks. The church kitchen is used by a variety of groups during the week, so we assume the worst and clean everything. I fling all the tea-towels into the laundry pile (because although they look clean, someone might have blown their nose on one). I turn on the dishwasher and water heater, preheat the ovens to 180℃. I throw away old sauces (check dates) and put dates on new sauces. Then I clean the microwave, check fridge temp etc. Get out 6 saucepans (because the saucepan cupboard is under the sink, and when S arrives I don’t want to keep asking her to move). Plates and jugs and dishes are put in hot cupboard, switched on, temperature set to 65º. D puts out ‘sign-up’ sheet for next week, so we’ll know roughly how many dinners to cook. I start to peel potatoes. We have coloured chopping boards, to avoid cross-contamination, so they are cut on the brown one. S arrives, and starts to peel the carrots. We only have one sharp knife, which she uses. (S comes every week to help us. She suffers from autism, so likes to do the same jobs, in the same place, with the same equipment each week; and any changes need to be discussed in advance. She also works very hard, and we miss her when she’s away.) We cut the carrots into sticks, because they go further than when cut into rounds (don’t ask me why). 9:45 Rinse meat, boil, wrap in foil. 10:15 T&H arrive, and set up the cafe in the front of the church. People begin to arrive for coffee. I can hear lots of laughing and chatting (loud chatting). At some point F arrives and washes his hands and says hello. F helps to set the tables with bowls, glasses and jugs of water. F also has ‘special needs’, but he takes more care over the setting of the tables than anyone else would. He is also in charge of the music, and has a preference for marching bands. The rest of the cooking is done to the sound of military music. 10:34 Tins of oil into oven to heat. 10:35 Strain potatoes, shake flour and salt and pepper over them, shake, put into tins of hot oil, into oven. S puts the custard into jugs, covers with cling film, leaves ready to be microwaved. S then goes for a coffee break. 10:50 Water on hob for cauliflower. S appears in the kitchen, to tell me the lights aren’t working in the washroom. I investigate, and find there is no electricity anywhere, and all the ovens are off. Not sure what to do, then electricity comes back on. Carry on cooking. 11:00 Put carrots onto hob. Salt all pans. Turn potatoes and move them around the ovens, because some ovens work better than others. 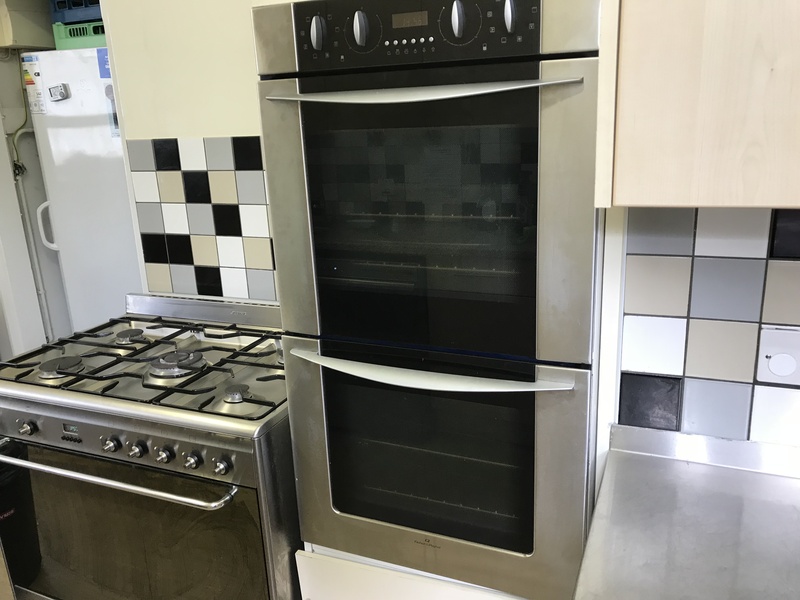 Ovens seem a bit cool. I check the ovens, and realise that although the electricity is back on, the ovens have set themselves to ‘automatic timer’ and are not working. I cannot remember how to override the automatic setting and spend 5 minutes pressing random buttons. Eventually they come back to life. I shove the dials to the hottest setting and swear a little. I start to make the cheese sauce. T appears in the kitchen and begins to explain, in great detail, what is wrong with the boiler. I am not terribly interested at this point, and find it difficult to remain polite, especially as he is standing between me and the fridge and I need the milk. 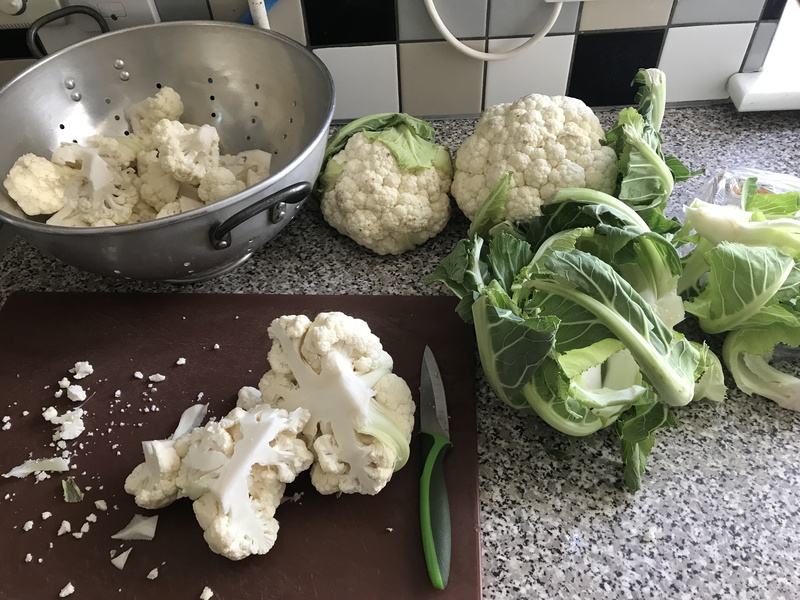 11:10 Cauliflower into boiling water. 11:30 Sausages in oven (sausages are an alternative for people who don’t like gammon). Prepare peas in microwave (because we have one person who will only eat peas). I also use the meat thermometer to check temperatures. The gammons are over 75º, which means they’re cooked. Phew. 11:30 D cuts the meat. I remember to check carrots. The cauliflower is cooked, so I strain it, and pour over the sauce. More people are arriving in the kitchen, washing up and chatting. I mostly ignore them (otherwise I will make a mistake). 11:32 Sweetcorn into boiling water. 11:35 Check/turn/move the roast potatoes again. 11:45 Make gravy. I’m not sure that anyone actually eats gravy. C arrives, and says that the person who always used to like gravy, even when there’s a sauce, died a year ago. I decide the baseline stipulation for people we cater for needs to be that they are not dead, so I only make one jug of gravy. I move all the food to the hot-trolley, which keeps it warm while people come and sit down and grace is said. There are bowls on the tables, and everyone puts in £3:50 (which I have to remember to take home and give to Husband with the receipts from shopping). I put the puddings into ovens (switched off) to warm slightly. I microwave the custard. I serve the meals onto plates, the servers take them to the people sitting at the tables. I serve 35 dinners, plus 3 people ask for an extra dinner to take home for someone who is housebound/ill. All the leftovers are put on the serving hatch, and people take them home in empty containers to eat in the week. Rev.P gives a short talk while I put the puddings into bowls. The servers collect all the dirty plates and serve the puddings. The washing-up team start to clean up, L takes home the tablecloths to wash. I take off my apron and drive Mum to her house, then go home. 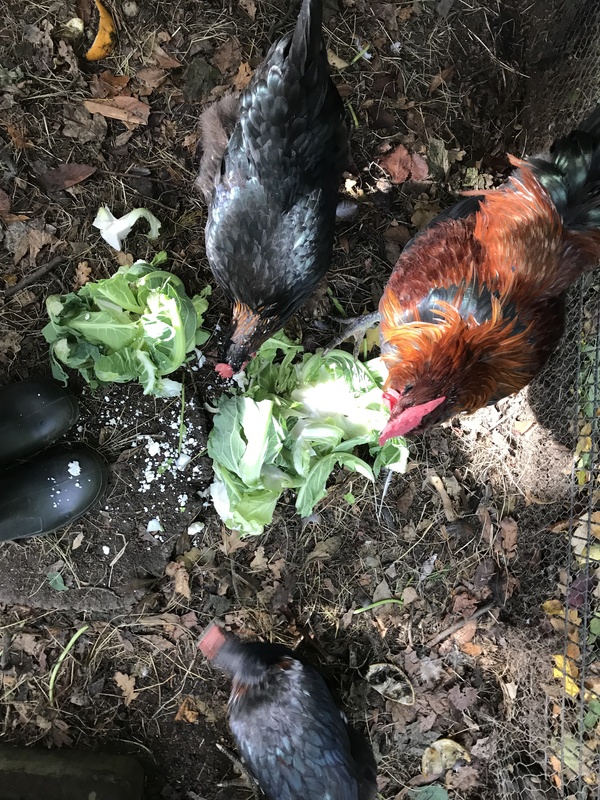 I feed the cats and ducks, and give the cauliflower leaves to the chickens, then go inside for a sandwich. Am knackered. Thanks for reading. Hope you have a good week with no disasters. 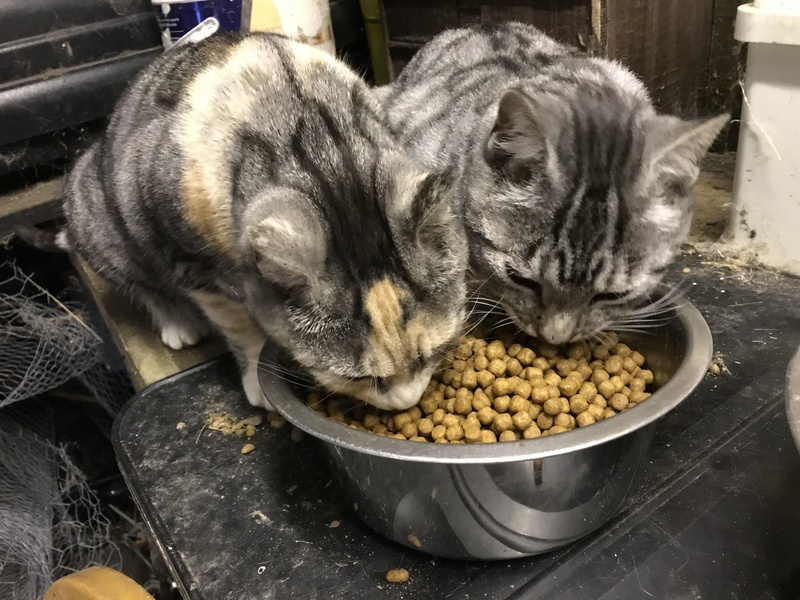 Got up, and sorted the ducks and chickens and fed the outside cats. Lots of signs of nest building, but no actual eggs, so either rats got there first or the hens are just pretending. Shopping order arrived. It’s my turn to cook at Lunch Club, and usually I would shop in Morrisons, because it’s cheap, but this week has been hectic, plus I keep having chest pains, so I decided to keep things simple. It costs more, but there will be a dinner at the end and I might survive. This week I decided to make Shepherd’s Pie. I use the term loosely, as it is made with beef mince, not lamb mince, so really should be called ‘Cottage Pie’. Plus, I am too lazy to actually make it into pies, (you should ask my family about my picnics sometime – they epitomise my lazy cooking style). So, really, it will be heaps of mince on plates with heaps of mashed potato. But Shepherd’s Pie sounds better. I put the frozen veg into the freezer (keeping things simple, remember?) and made a start on the mince. The mince recipe is modified from a Nigella Lawson recipe, because I like her food, even if I don’t manage the flirty eyes when I cook. It is a brilliant recipe as it involves putting lots of veg through a processor so it forms a mush, then adding it to mince. So children (and elderly members of lunch club) eat lots of tasty vegetables without realising it. Due to a recent decrease in numbers (none for good reasons) I decided to cook for 35 people. I began to peel onions and mush them with bacon, and add them to the mince to fry. Onions for 35 people makes you cry. 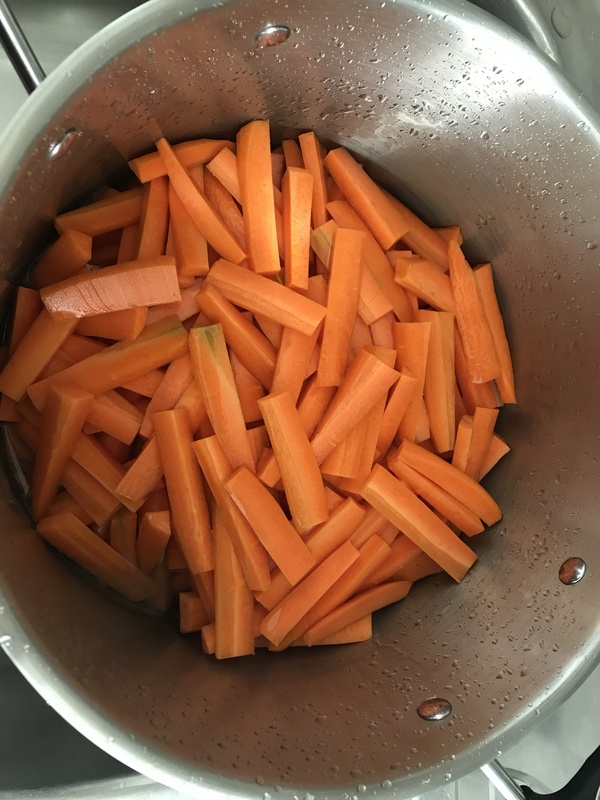 Then peeled carrots, feeling slightly guilty. Every week, we have a young woman who is autistic, who comes to help us prepare the veg and wash up. She always peels and chops the carrots. She works really hard, and never complains (except the week when my sister came to help, but that’s another story). However, she does not like things to change, and she always peels the carrots. But I needed to mush them and add them to the mince, so this week I did them. This might cause angst tomorrow. I will worry about it then. Added whiskey, Worcestershire sauce, tomatoes, allspice, cloves, and other stuff. Left to simmer for about an hour while I washed up. 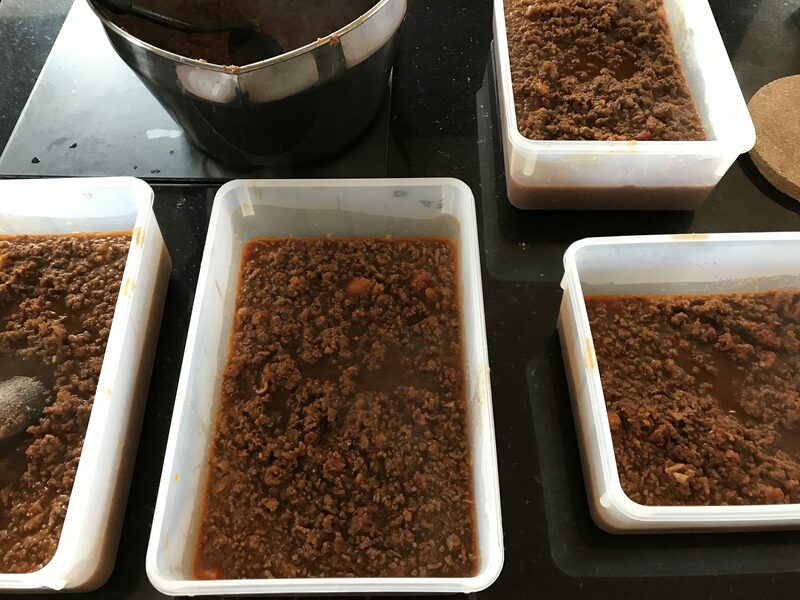 When it was cooked, I transferred the mince to plastic containers. This is one of the difficult bits – when you are cooking for lots of people, you must ensure that everything is cooled down and refrigerated within two hours (otherwise it has to be thrown away, which is something of a waste). 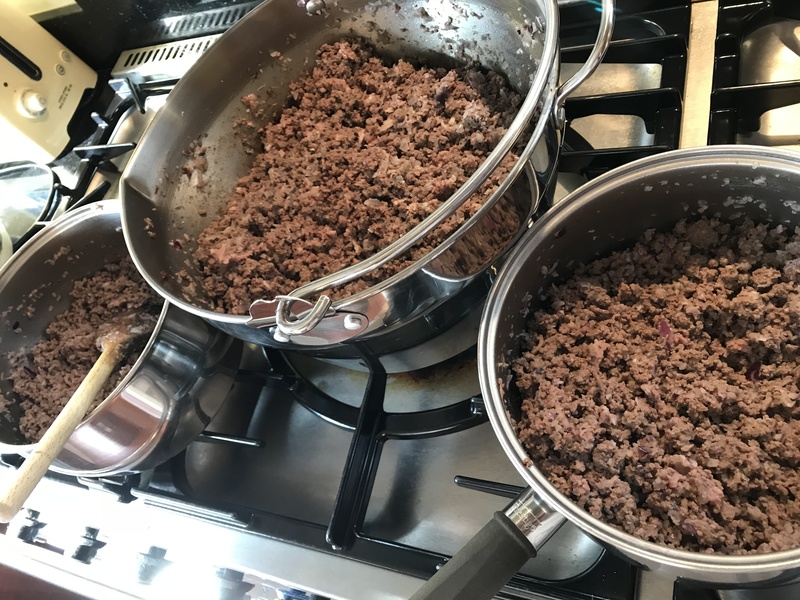 Cooling down heaps of mince is not as easy as it sounds. Finally was cool enough to go into fridge. Washed up. Cooked ginger sponges (will reheat them tomorrow with custard for pudding). Washed up. Packed car with rest of stuff, then allowed dog back into kitchen (she is banished when I cook, in case a stray hair floats upwards and contaminates the food). Considered whether chest pains were better or worse. Have a slight nagging thought that heart problems begin with chest pains. But I feel I have already had a brain tumour (rare) and that to also have heart problems (also rare) is simply too unlikely. Decided chest pains are more likely due to lugging crates of water around for the ducks, and took an aspirin. Rest of day spent walking dog, doing washing, clearing up cat sick (old decrepit cat who lives in the utility room) and reading. 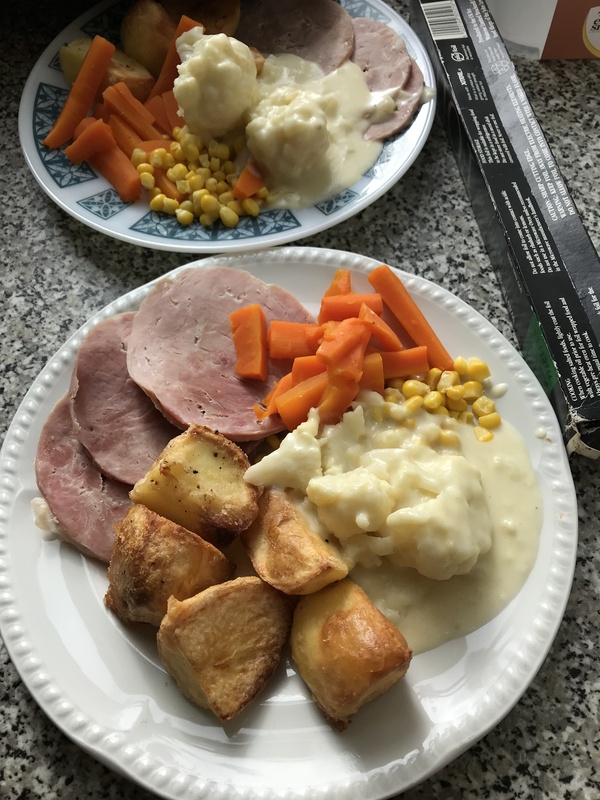 Got a dinner out of freezer for our own meal – after a day cooking mince, I cannot face making something else for us to eat. Thank you for reading. By the way, have you read a copy of CLARA yet? It’s getting some good reviews already, which is very exciting. Take a look at the Amazon link, to see what other people are saying. How was your week? I cooked at Lunch Club. Usually I make a syrup sponge, but I thought I’d try something different this week, so I used tinned pears instead of syrup and added some ginger to the sponge mixture. I was a bit worried about cooking tinned pears – they might have turned to mush in the oven. It was okay. I thought it was a bit lacking in taste, tinned pears are a bit bland, but it wasn’t horrible, which is the main thing. I might try marmalade next week. I cannot tell you how much I dislike cooking dinners for large numbers of people. However, Lunch Club is something special, and I always come home happier than when I went, even though it’s also really hard work (as you know – I believe you told me that if you ever agree to help again I should shoot you!) This week the ‘kitchen team’ were mainly men, ranging in age from about 65 to almost 80. That says it all really! 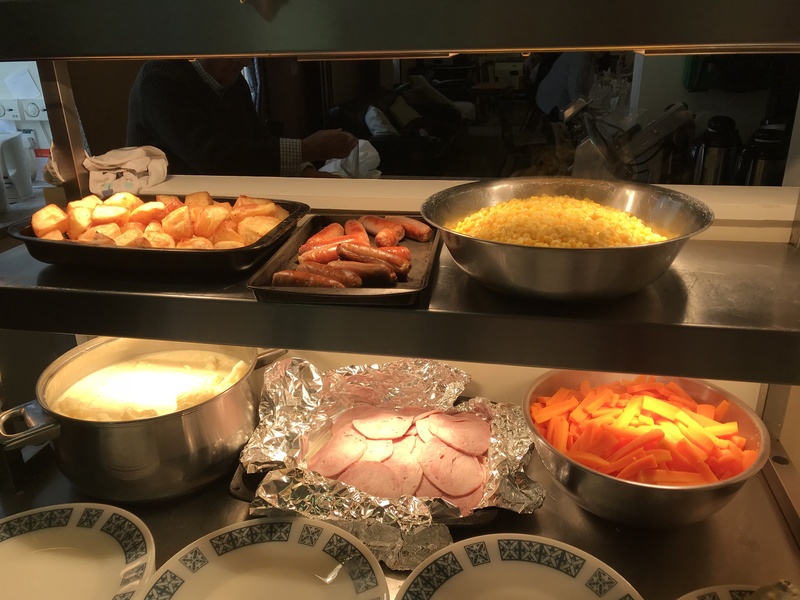 Each week we produce a healthy meal for forty people, and they pay £3:50. Some weeks we are an efficient productive team. Other weeks I feel like I have wandered on to the set of a Dad’s Army film. Whoever is cooking buys the food, then arrives at the church early to start preparing. Gradually the rest of the team arrive, some by bus, some via ‘Dial-a-Ride’ and some walk or drive. Everyone is pleased to see each other, so it’s quite a social time. It’s also the time when we hear about ailments. The team are mostly not young, so it’s not coughs and colds – they will quite casually mention that they “had a minor stroke in the week” or “had bit of a heart attack so had to call an ambulance.” I am always amazed how they seem to take in their stride, to carry on with life as soon as they feel well enough. They also laugh a lot. At some point, before the ‘oldies’ arrive (who are actually no older than the team some weeks) we have a quick prayer. This is always more enthusiastic when I am the cook (need all the help we can get!) When I got there this week, one of the team had rolled up his trousers to show some injury, which led to a general discussion of scars until I called them to order and suggested that we should get on with praying. Slightly worried as to where the conversation might lead. Like I said, I am the bossy one. 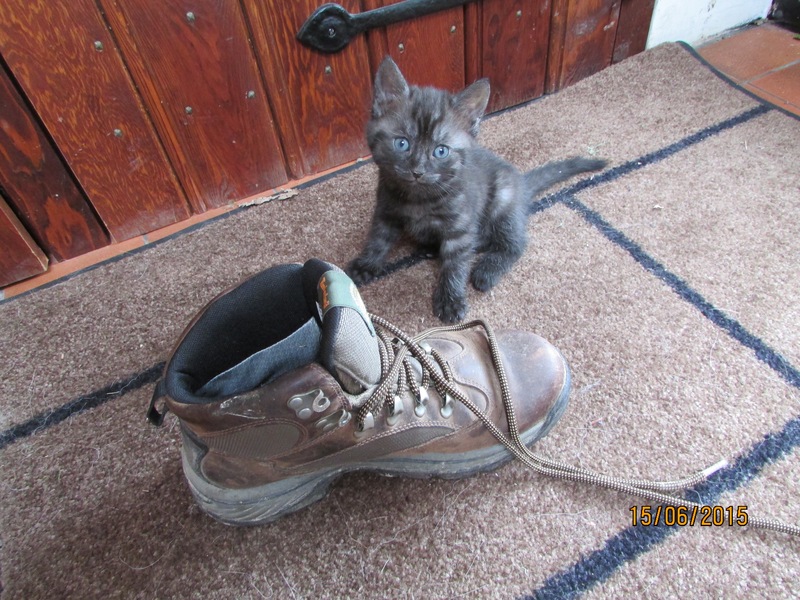 This week one of the church members popped in with his little boy. The oldies love to see children. They are, I have noticed, quite competitive with how many great-grandchildren they have. I can’t really chat to them when I’m cooking (too busy trying to not burn anything.) But when I’m not the actual cook, I love listening to them, they have so many tales about growing up during the war, living in a world that has changed so much. I love how enthusiastic they still are, how they will arrive excited that dog-racing has started in the next town, or there’s a new club they can join, or even a new knitting pattern has arrived. Their obvious enjoyment of life makes me realise that growing old doesn’t have to be scary, there are still deep friendships and loud laughter. Especially laughter. Friday lunch times are always some of the happiest, and most exhausting, hours of my week. PS. Going on a trip to Poland. Never been there before. 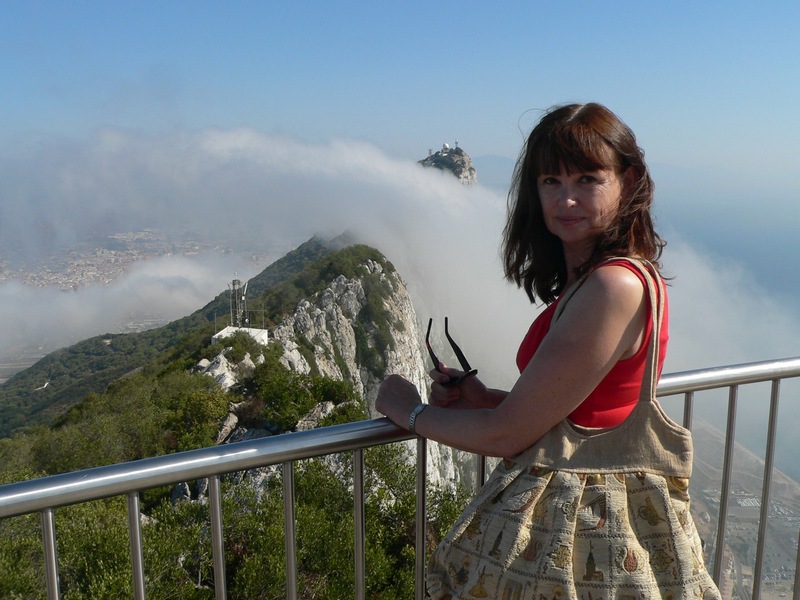 Why not sign up to follow my blog? Then you won’t miss reading about my trip! Thanks for your letter. You are very lucky that one of your boys cooks. I wish someone in my family did. I hate cooking dinners, really hate it. It is a pressure every day, trying to decide what to eat in the evening. Part of the problem is that although I hate cooking, I do like eating decent food. So ready-meals just don’t do it for me. None of family really cooks though, unless it’s Mother’s Day or something. Actually, that’s not quite true. When I was in labour with Son 1, Husband did cook pizza for two year old daughter. I told him he just had to take it out the freezer and put it in the oven. Which he did. Literally. It wasn’t until daughter complained there was “white stuff stuck to it” that we discovered the polystyrene base had also gone straight from oven to freezer. I think that’s the last ‘dinner’ he has ever cooked. I blame his mother. My sons also aren’t great communicators when they’re at uni. I send them emails and texts, letting them know what’s happening, but they rarely reply. Every so often I send an, “Are you dead?” text. To which they usually reply, “Yes, murdered horribly while in pub.” So I know they’re basically alright. You can then, imagine my concern a few weeks ago when I arrived home to find a message on the answer phone saying, “please call me,” and a text saying the same and three missed calls on my mobile. Heart in mouth I dialed his mobile, hoping that he would pick up, wondering who I should call if he didn’t. He did. We discussed the whole idea of beginning messages with “it’s not an emergency.” Then I told him how to make soup. You have to read my book when it’s published. It is not optional for sisters. It won’t scare you, you’ll be fine. Actually, I have nearly finished the main part, the bit about the psychopath. Which I’m quite relieved about because she’s not very nice. I did lots of reading, read some papers by neuro scientists and got some of their books. I also watched some clips on YouTube, so I could try and imitate the speech patterns of how known psychopaths talk. It was all very interesting actually. The thing I found most disturbing was how likeable the psychopaths were. I think of myself as a good judge of character, but these people, who had sometimes murdered dozens of people, came over as very nice people. They were the sort of person you enjoy being with, the people who you invite round for dinner. Your writers’ group sounds fun. I would love to be able to talk lots about my book. I wouldn’t want feedback though, that would be way too scary. You can be my writer’s group when you come over. I can talk for many weeks about psychopaths – how long are you staying for? I might even bake you a cake. I like making cakes, it’s only dinners I find emotionally difficult. I will make it during Lent, then it will count towards one of those ‘random acts of kindness’ that we’re all supposed to be doing every day. I have a feeling that might turn out to be even more stressful than having to cook a dinner every day. PS. Bring your wellies. It hasn’t stopped raining since you were here last time. PPS. Happy Chinese New Year. It’s the year of the Monkey! This letter is a reply. Do you think this is healthy? Every day when he gets home from work, Husband drinks a mug of tea (300ml) and adds 6 teaspoonfuls of sugar. Another discussion point was his annual stressful event at work. No, not a performance appraisal but his need to bake something for the ‘Team Baking Competition’. The competition has rounds, so it’s quite a knack to find something that meets both his competitive need to not fail miserably but also not good enough to win and go through to the next round. I absolutely refuse to do the cooking for him (I tell him it wouldn’t be morally right but actually I just don’t want to get lumbered with it every year.) This year he made flapjacks. I wrote out a ‘fool-proof’ recipe, the sort of thing I used to write for the children when they were very small. It was almost foolproof. Small children (who I have trained) know things like “do not hold the cat when cooking, however much he mews for attention it is unhygienic.” Or, “if you weigh the syrup on one work surface and then carry the spoon to the saucepan on the cooker, you will leave a sticky trail on the floor.” Even the basics, like “wash your hands before you start” seemed to be a new idea. Though of course, if cooking while holding a cat there does seem very little point. However, kitchen survived and I am hoping that cooking the flapjack will have killed all the germs (plus I will never meet the people who devised this activity in the first place) so I am hoping it’s all good. Husband informs me that ‘international business executives’ do not need to know how to bake flapjacks. Except clearly they do.